Gone4Ever Recycling is certified to handle the most sensitive documents properly. We serve doctors, lawyers, insurance companies, and others who handle secure information on a regular basis and need to be able to trust that it will be completely destroyed. You can even schedule to come in and watch your documents get destroyed, and we’ll also provide you with a certificate of destruction. Our affordable services are perfect for individuals as well as businesses. We never charge for handling or unloading and never lock our customers into long-term contracts. 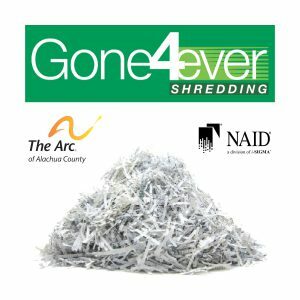 Due to the overwhelming demand for free Gone4Ever shredding services on Wednesdays, The Arc will limit free shred Wednesday to the FIRST WEDNESDAY OF EACH MONTH and limit each household to one banker’s box, or roughly 27 lbs. 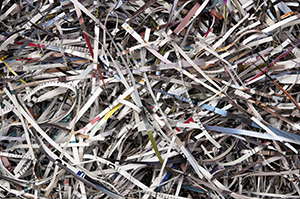 of paper, per free shred Wednesday, per month. When you need a paper-shredding company, choose Gone4Ever Recycling!